One of the delights of our garden is the large number of avian visitors. Having spent years in sparrow-starved South London, we are delighted even by the appearance of that common house bird but sometimes we get something new. 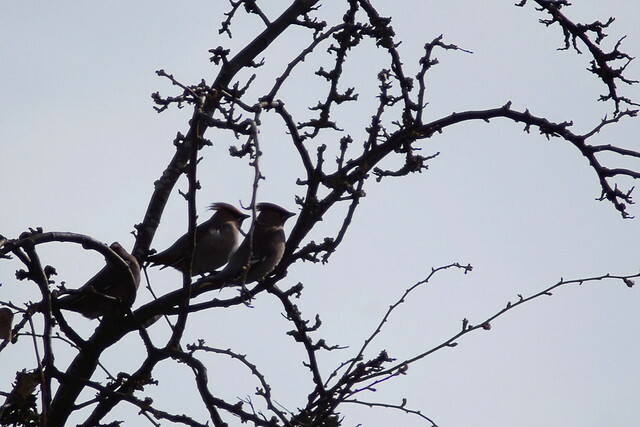 Waxwings (shown above, in a picture Jane took at the end of March) are in that latter category. The hawthorn tree sits just past the fence at the back of the garden and overhangs it. These three turned up on two successive days and spent a long time admiring the view from the top, bracing themselves against the wind.